All users will be charged a $25.00 look-up/handling fee for each sample set utilized, and in addition, a $30.00 per box examination fee for those boxes studied at the repository. In cases of off-site usage, additional charges are: $25.00/box for the first month of usage, $50.00/box for the second month of usage, and $75.00/box for the third month and for each succeeding month thereafter. In addition, off-site users will pay for round-trip shipment. The charge for use of data files is $30.00/file utilized at the Repository or sent off-site for copying. Alternatively, a $125.00/day for a six-hour day will be the charge for as many files as can be utilized during one, six-hour workday. 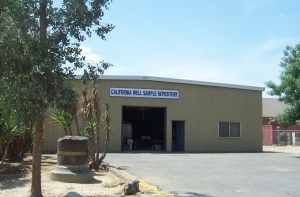 Copying is to be accomplished by a reputable bonded copying company in Bakersfield, over the span of no more than one working day. Arrangements for copying are to be made, and paid for by the user. No files may be borrowed. Geologic reports in the "Getty" Collection may be reviewed and sent out to be copied for a fee of $50.00 per report. There is a $500.00 per well fee to obtain seismic velocity survey data. A list of available wells can be found in the "Catalog" section, along with a contract that must be filled out and signed prior to obtaining the check shot survey data. Please download the contract, fill in all requested information, and add all requested wells to an amendment to the agreement. 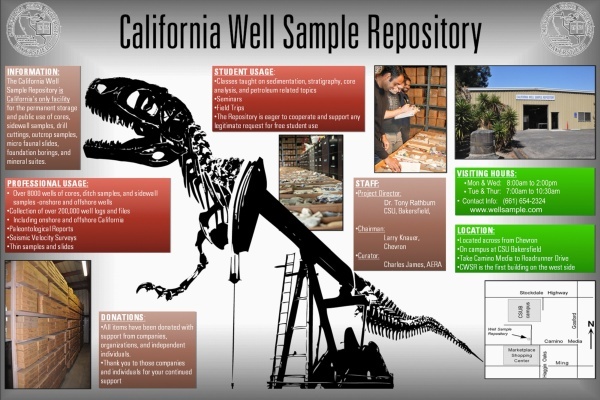 The contract should then be sent to the California Well Sample Repository, along with a check for the full price of the requested velocity surveys at a fee of $500.00 per well. Upon receipt of the fee the velocity survey data can be emailed to you, faxed or mailed. The only exception to the user’s fees shall be college/university faculty or registered students; each faculty/student wanting to have fees waived must first submit that request in writing and receive prior authorization from the Project Director or Curator or their delegated authority. Students are limited to 15 sample boxes per visit to the repository. Fees may be paid by check to the CSU Bakersfield Foundation or cash, but payment should be made only after the Project Director or Curator or their delegated authority, has made the proper billing, and the bill signed by the user. Note: fees are subject to change without notice. The charge for the examination of paleontological slides shall be $30.00/slide. The examination of these slides is restricted to the repository. The charge for the use of paleontological reports shall be $50.00/well. These reports may be sent off-site for copying as prescribed above. No files may be borrowed. Our fees are subject to change. Please call in advance to verify.